Will it be more like the Surface Pro 4.5? Following the recent revelation that the Surface Book 2 might not be launched at Microsoft’s Spring hardware event, here’s another rather disappointing piece of speculation on its sibling, the Surface Pro 5: rumor has it that the hybrid won’t change much from the existing model. Twitter users questioned who his source was, but unsurprisingly he didn’t say – presumably someone inside Microsoft. They also badgered him for further details, but Thurrott said he didn’t know anything more than what he’d written above. Although he did add a second tweet to say the device “sounds like Surface Pro 4.5”. 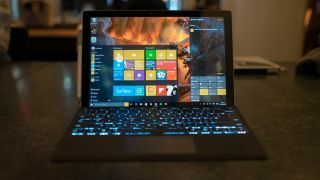 In other words, this makes it seem like the next Surface Pro incarnation will essentially be the same as the existing hybrid, but with upgraded hardware and a Kaby Lake processor. In short, the very minimum you’d expect in terms of an upgrade. The proprietary power connector is here to stay, but it’s likely that it’ll come alongside USB-C ports. It’s difficult to imagine that Microsoft wouldn’t be making the switch to USB Type-C with the SP5, regardless of what type of power connector is used. The current Surface Pro 4 comes with a USB 3.0 port a mini-DisplayPort. So, if you were hoping for a big juicy refresh and/or some innovative tricks with the Surface Pro 5, then if this speculation is on the money you’re going to be pretty unimpressed by the new hybrid. As to whether we’ll see it soon, indeed possibly at Microsoft’s impending hardware event, that also remains to be seen – as is the case with the next Surface Book, although as mentioned, the grapevine insists that the latter is still quite a way off. That being the case, maybe the Surface Book 2 will do a lot more to differentiate itself than the next Surface Pro model, if the latter does turn out to be a very minor step forward.